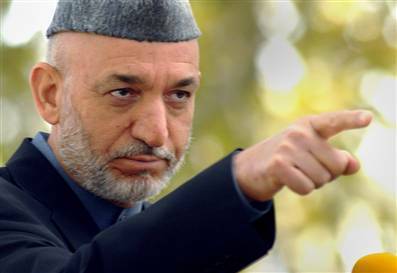 Is President Karzai a heroin addict? Afghan President Hamid Karzai has been acting certifiably crazy. At first, everyone attributed it to hurt feelings (an invitation to the White House had been abruptly rescinded). But it has got worse, with Karzai accusing Americans of engineering Afghan election fraud and hinting that he could join the Taliban. Now Peter Galbraith, the American who was once a top UN official in Afghanistan, has told MSNBC that the erratic behavior may be about a lot more than diplomatic snubbings. Galbraith said he questions Karzai's "mental stability" and dropped a not-so-subtle hint that the Afghan president is a herion addict. "He's prone to tirades," Galbraith said. "He can be very emotional, act impulsively. In fact, some of the palace insiders say that he has a certain fondness for some of Afghanistan's most profitable exports." Galbraith is not the world's most neutral source on Karzai (he was removed from his UN job after accusing Karzai of election fraud), and other diplomatic types say Karzai is paranoid or depressed, not on drugs. Either way, his behaviour is bad news for the United States, which needs a strong ally in Kabul if it is to bring most of its troops home from Afghanistan by next year. The White House is evasive on Karzai; press secretary Robert Gibbs danced around the question of whether Karzai is a US ally Tuesday, saying, "He is the democratically elected leader of Afghanistan." Many foreign policy analysts say it is time for the United States to effectively ditch the president; writing in the New York Times on Wednesday, one former Defence official argues that if the United States wants to get out of Afghanistan, it is going to have to ignore Kabul (and Karzai) and deal directly with local leaders who will actually cooperate. "Karzai should be treated as a symbolic president and given the organisational 'mushroom treatment,' " he says. "That is, we should shut off the flows of information and resources directly to the national government." Afghan President Hamid Karzai has been acting certifiably crazy. At first, everyone attributed it to hurt feelings (an invitation to the White House had been abruptly rescinded). But it has got worse, with Karzai accusing Americans of engineering Afghan election fraud and hinting that he could join the Taliban. Now Peter Galbraith, the American who was once a top UN official in Afghanistan, has told MSNBC that the erratic behavior may be about a lot more than diplomatic snubbings. Galbraith said he questions Karzai's "mental stability" and dropped a not-so-subtle hint that the Afghan president is a herion addict. "He's prone to tirades," Galbraith said. "He can be very emotional, act impulsively. In fact, some of the palace insiders say that he has a certain fondness for some of Afghanistan's most profitable exports." Galbraith is not the world's most neutral source on Karzai (he was removed from his UN job after accusing Karzai of election fraud), and other diplomatic types say Karzai is paranoid or depressed, not on drugs. Either way, his behaviour is bad news for the United States, which needs a strong ally in Kabul if it is to bring most of its troops home from Afghanistan by next year. The White House is evasive on Karzai; press secretary Robert Gibbs danced around the question of whether Karzai is a US ally Tuesday, saying, "He is the democratically elected leader of Afghanistan." Many foreign policy analysts say it is time for the United States to effectively ditch the president; writing in the New York Times on Wednesday, one former Defence official argues that if the United States wants to get out of Afghanistan, it is going to have to ignore Kabul (and Karzai) and deal directly with local leaders who will actually cooperate. "Karzai should be treated as a symbolic president and given the organisational 'mushroom treatment,' " he says. "That is, we should shut off the flows of information and resources directly to the national government."